In addition to the teambuilding props shown here, Jim Cain has prepared a very unique collection of teambuilding books, props, gear and tools in his 'experiential garage sale.' You can request a copy of the most recent list (currently at 40 pages) by contacting Jim directly at: jimcain@teamworkandteamplay.com. First, the new book, Rope Games is now available. Single copies are available from training-wheels.com. For bulk orders (50 or more books) contact Jim directly at jimcain@teamworkandteamplay.com. 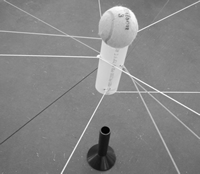 Next, three new teambuilding tools (featured in the Rope Games book and available from training-wheels.com beginning Fall 2013). A 3-D Bull Ring prop. 12 neon colored strings attached to a PVC tube. Takes the Bull Ring activity to a whole new level. Goin' Fishin' This Bull Ring variation replaces the metal ring with a wooden block that has 6 different metal hooks. Pick up and stack a variety of objects, including wooden blocks and (my favorite) a set mouse trap! The Rope Games Kit. A unique collection of rope, string, webbing and cordage that you can use for over a hundred different activities. 1. Teamplay Tubes A unique collection of PVC tubes and connectors that can be used for more than a dozen teambuilding activities. Featured in the Teambuilding Puzzles book. 2. Funderbirds This simple hand version of hacky-sack is perfect for get acquainted activities and more. 3. Lycra Tube A giant rubber band tube made from lycra that creates the perfect place for processing with a group, and for kinesthetic teambuilding activities. 4. Marble Tubes Are available in two varieties, Open (U shaped) and Closed (O shaped) tubes. Each kit comes with 15 tubes, marbles and a sturdy stuff sack. 5. Teamwork & Teamplay Team Kits — Newly expanded! This kit contains instructions and a collection of portable team props including: a Raccoon Circle, a Bull Ring, two sets of 2B or KNOT 2B ropes, a Worm Hole, a Funderbird, a Debriefing Virtual Slideshow Clicker, ten Rope Handcuffs, and an Elastic Band for SNAP! 6. 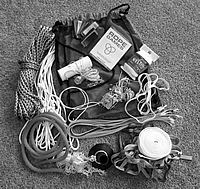 The Ropework & Ropeplay Collection of Team Activities Complete with an extensive manual, this unique collection of ropes can be used to facilitate more than 200 different team activities. For wilderness and travel programs, or facilitators that just like to travel light, The R&R collection gives you the most team activities for the least price. 7. The Water Tube One of the most compact, portable and refreshing team activities ever for a hot summer's day. The PVC water tube comes with a sturdy wooden base that stores inside the tube. 8. The Puzzle Cube The most versatile portable spider web and teambuilding prop on the market. This collection of PVC tubes and connectors can be used to create five different sizes of cubes, and also connected to create 10 additional team activities. 9. Corporate Maze Here is a well crafted corporate gridwork, designed by Jim Cain and produced by Robertson Harness that can be used for the Teamwork & Teamplay activities Gridlock, and several other activities in the Teambuilding Puzzles book. 10. Boardwalkers These sturdy wooden trolleys are linked together for groups up to 12 participants. Each set contains 8 wooden segments, ropes and links. 11. Flexible Trolleys Weighing less than a pound, these trolleys designed by Jim Cain and produced by Robertson Harness are perfectly portable. 12. 2B or KNOT 2B Group Consensus Ropes Although there was no room left in the current Adventure Hardware catalog, a collection of these consensus building ropes is still available, via special order. 13. Magic Carpet These colorful and durable plastic carpets hold up to the toughest usage. Big enough for approximately 10 adults. 14. Raccoon Circles 15 foot long segments of strong tubular climbing webbing in a variety of colors. You can use these circles for more than 100 different team activities. 15. Foam Noodles and Noodle Burgers and Chips Play all the popular team activities from Sam Sikes and Chris Cavert's book, 50 Ways to Use Your Noodle, with these colorful foam noodles. 16. The New Teamwork & Teamplay Nail Puzzle Featured in the Teambuilding Puzzles book, this new version of the classic nail stacking challenge really drives home the value of connection and unity. 18. Tangrams Featured in the Teambuilding Puzzles book. A Do It Yourself kit of sturdy and colorful plastic sheeting whith which you can create your own tangram patterns. Comes with instructions. 19. Foam Boomerangs If you enjoy Jim's workshop on Wings, Strings and Flying Things, you'll enjoy these foam boomerangs. Perfect for learning the basics of tuning, throwing and catching boomerangs. 20. Arrowhead Puzzle If you are looking for an activity to explore doing more with less, here is an inexpensive prop that really makes the point. 21. The Blind Shape Activity One of our best active learning activities for supporting inclusion and unity. Featured in Teambuilding Puzzles and A Teachable Moment, this collection of 7 different shapes comes in five different colors, for a total of 35 pieces, plus a storage container. 22. The Do It Yourself Cube Kit Make your own cube spider's web using these special PVC connectors. Instructions and eight corner connectors included. 23. Lycra Blindfold These colorful, comfortable and washable blindfolds are made of stretchable lycra, so one size fits all. 24 Pipe Chimes This set of tubular pipe chimes covers more than a full octave and can to create a team orchestra.